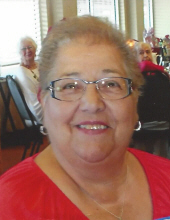 VILASI, Clara D., 76, of Sun City Center, passed away on Tuesday, January 8, 2019. A native of Paterson, NJ, she had resided here since 2005 coming from Lanark Village, FL. In her life, Clair was an Executive Assistant with Wyeth Pharmaceuticals, also sold real estate in N.J. and Florida and was an avid sailor and loved sailing in the Long Island Sound. She loved to draw flowers, baking and reading. Most of all, she was a loving and caring mother and grandmother. She was a member of Prince of Peace Catholic Church, Sun City Center, FL and the Aquasizers. She is survived by her husband, Richard L. Vilasi; sons, Richard Vilasi; daughter, Maria Vilasi; sisters, Marie Monaco and Fran Papa and grandchildren, Jacob, Steven, Keven and Lorissa. The family has requested that all donations be made to the St. Jude Children's Research Hospital. To send flowers or a remembrance gift to the family of Clara D. Vilasi, please visit our Tribute Store. "Email Address" would like to share the life celebration of Clara D. Vilasi. Click on the "link" to go to share a favorite memory or leave a condolence message for the family.